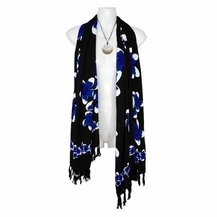 This floral scarf will make a wonderful addition to your collection of scarves, shawls, and wraps. It is versatile too, so it can be worn in various styles. Wrap your scarf around your neck or as a shawl around your shoulders or anything your imagination can dream up. Your scarf adds a nice touch to evening wear or can be worn for a casual look with a pair of jeans and a t shirt. It?s versatile enough that you can wear it for all seasons. The fabric is soft, smooth and silky to the touch with fringe on both ends. lightweight and comfortable, you can just fold it up and bring it on the go. The perfect gift and accessory for all occasions. Scarf measures 66 x 22 inches (168 cm x 56 cm) on fringed lightweight rayon. Please note, due to the handmade nature of this item color may vary. Approx 66 x 22 inches (168 cm x 56 cm). Color/design may vary due to handmade nature.